PvdD cake, a photo by CAKE Amsterdam - Cakes by ZOBOT on Flickr. 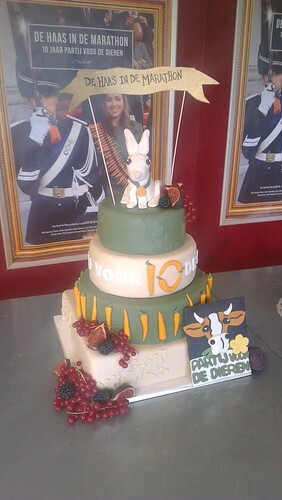 Cake made for a presentation by the PvdD (Partij voor de Dieren - Party for the Animals) and for the opening of the film about the last 10 years of the PvdD, "De Haas in de Marathon" produced by the Nicolaas G. Pierson Foundation, who also produced the films "Meat the Truth" and "Sea the Truth". Vegan Chocolate cake with soy whip and organic vegan jam, covered with fondant with Nature's Flavors natural and vegan food coloring!! !